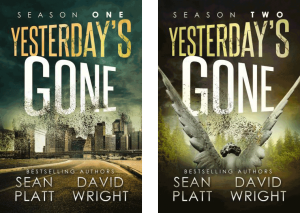 Get the First Two Seasons of Yesterday's Gone for FREE! Read the groundbreaking sci-fi horror series with over 1,000 5-star reviews! They thought they were alone. They were wrong. On October 15th, humanity went missing. A handful of scattered survivors wake to find the world empty of friends, family, and neighbors. Among them, a child searches for his family. A special agent turned enemy of the state survives a fiery plane crash with no way to reach his daughter. A serial killer discovers he’s no longer at the top of the food chain. Now these strangers must find the strength inside them to weather the new world. In the absence of civilization, a new threat emerges. In the stillness, it waits and watches, preying on their weakness. Their only hope is to find more survivors, rise above their fear, and face the oncoming darkness. But can they unite before they too are lost? And can they all be trusted? SEE WHO LIVES AND WHO DIES!